Almost all these tracks apart from those after 1971: got played at Manchester‘s premier soul venues. A perennial Twisted Wheel and Blue Note favourite was the atmospheric Cleo’s Mood – just hearing it today can transport me back to those dark distant cellar places. They performed live at The Whitworth Street Twisted Wheel All nighter in November 1967. Between each number they played Behave Yourself the B side of Green Onions. They were by far the best soul act that I ever saw at that time. Tune Up was another track that was often played at the Blue Note. it was only released in the UK on an LP. 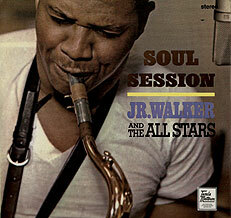 It was, however, one of Junior’s first recordings in the USA on the Harvey label (Harvey Fuqua‘s label later bought out by Motown). He was an amazing tenor sax player and lead singer. 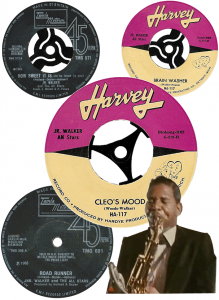 I love all his stuff WALK IN THE NIGHT – superb, Cleo’s Mood – brilliant and so on. The story of Junior Walker at the Twisted Wheel is told by a Mod who was there, in the book: The Manchester Wheelers. Photographs courtesy of thevideobeat.com Incidentally it’s “TUNE UP” out of all the fantastic tracks listed above that gets an entry into Kev Roberts Top 500: surely that tells you something about the Northern Soul scene: records are chosen on that scene to have more cache/value if they are rare (Soul label) rather than their brilliance – Ho Hum such is the way of the world. And that’s not to take anything from that particular track, was it rare? Well it was very popular at Manchester Blue Note club.